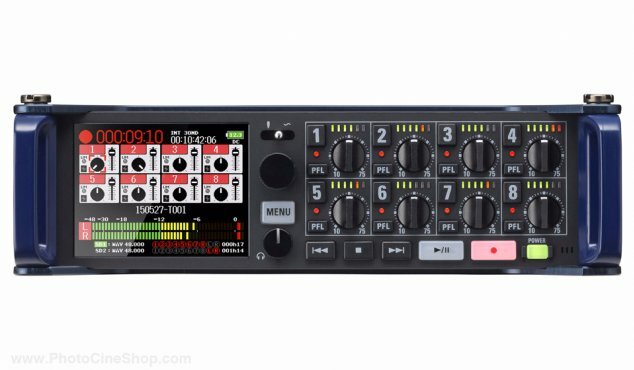 The Zoom F8 Multi-Track Field Recorder features eight analog input channels with lockable XLR/TRS combo jacks. 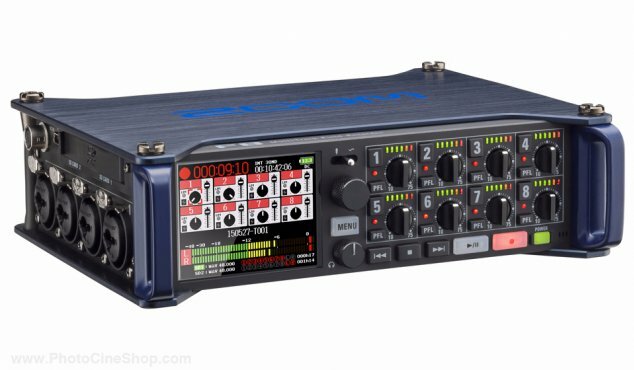 The Zoom F8 Multi-Track Field Recorder features eight analog input channels with lockable XLR/TRS combo jacks that provide +75 dB maximum input gain, and support for +4 dB inputs with an EIN of -127 dBu or less. It can record up to 10 tracks simultaneously (channels 1-8 plus a stereo mix), or up to eight channels when recording at the A/D converter's maximum 24-bit 192 kHz resolution. Two SDXC card slots can be used simultaneously for recording even longer sessions, and can also be used as card readers when connected to a computer via USB. When operating via USB, the unit can be used in a 2-in/2-out configuration as well as an 8-in/4-out audio interface (driver required for windows). A built-in slate mic allows you to make voice memos and the unit's slate tone can be used to confirm specific levels.